5 Weddings movie 20 days, Total worldwide box office collections are 9.50 crores Approximately. 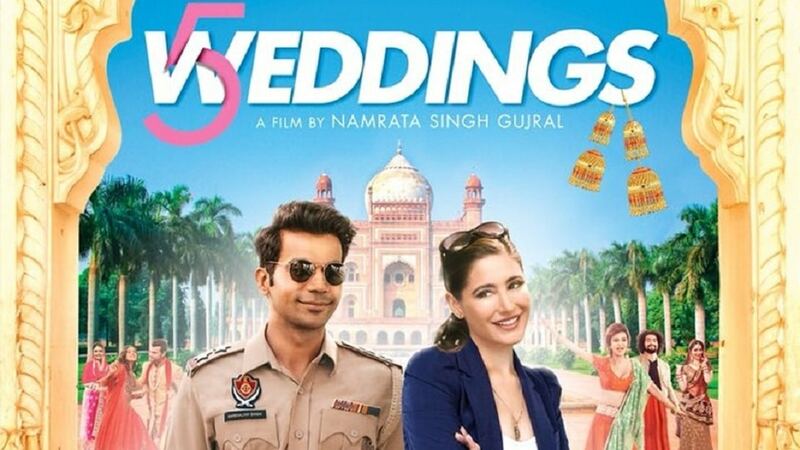 5 Weddings are another concept film about an American journalist traveling to India and to shoot a documentary of Bollywood weddings. With this, he plans to uncover different wedding cultural of India. During his journey, she meets his lost loves & travels with him to different destinies. Nargis Fakhri (Shania Dhaliwal) plays the foreigner role whereas Rajkummar Rao (Harbhajan Singh) plays the role of the cop. Shania being a foreigner find major cultural difficulties. This move has shown a proper stereotype India movie. The movie starts with Shania Dhaliwal a Journalist from California visits India to cover five Indian weddings as his project. The major difficulty she faces is to research about the wedding culture which gives her a tough time to shoot the 5 Punjabi weddings. The move clearly shows more of Punjabi culture and their wedding and less of acting. We expected to see Rajkummar (Harbhajan) doing some great acting, but the story and the dialogs of the movie could not catch with his talent. The move does not make sense, to create some funny moments. Rajkummar’s acting has given some extra starts to the movie. Also thanks to amazing actors like Bo Derek, Candy Clark, Anneliese van der Pol also saves the movie with their good acting skills. This movie is a one-time watch movie, but missing it won’t be a loss. Background score is excellent of the film is done by Christopher French. The screenplay is the major drawback of the film. Next articleJarugandi Tamil Movie Review and Box Office Collections – Hit or Flop?